Although I do not have any kids, I do enjoy spending time with my cousin's kids. We are really close and I consider myself more of an Aunt than anything else. Sometimes we like to curl up on their bed and read a story. My "nephew" is 6 and my "niece" is 10. After I took a peak at the book I knew it was the perfect reading level for them. So I opened the book on their kindle (yes, they have more technology than I do!) and we started to read. I found this book to be adorable and charming. The kids kept pointing at the pictures and referencing the book and how they too wished they had a dinosaur. I did, however, have to help them with just a few words and we got off on a tangent about what it means for something to be "extinct". It was fun and also a learning experience. I was one proud Auntie! He has also written a bunch of other fun stories that I will be purchasing for the kiddos! 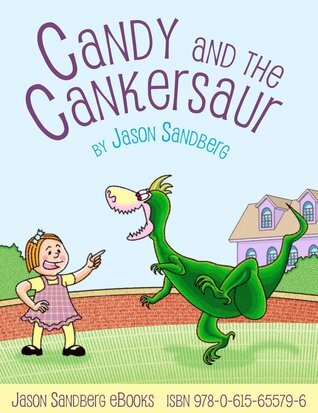 "Candy and the Cankersaur" is a picture book about a girl who receives a dinosaur as a gift and her determination to train him to be a good pet. It's a fun homage to Syd Hoff and will make all dinosaur-crazy boys and girls happy. Want your own copy of the book? Well, "Candy and the Cankersaur" is available on Amazon, Nook, iTunes and Kobo. However, you could also enter my giveaway for a chance to win your own copy! Jason Sandberg was kind enough to provide me with 10 copies that I can giveaway. To enter is simple, simply fill out any or all of the options on the form below. Goodluck! Disclosure: The author provided me with a copy of this book in exchange for a review. However, all the opinions expressed here are my own. I'd love to read the New Crown. It sounds like a wonderful book with a female "hero"